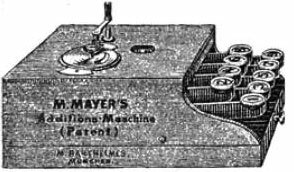 In 1881 the german inventor Max Mayer from Munich devised an adding machine, which was patented in 1884 (german patent DE29206 27.04.1884 for Additionsmaschine). Later Mayer obtained 3 more german patents (DE35496, DE42043, DE44398) and a couple of french patents (162118 and CF162118). The machine was initially produced (from 1887) by the mechanical shop of A. Barthelmes in Munich. From about 1902 a model with a printing mechanism was put on the market under the name Summa, with price 50 M. It seems only a few devices has been produced and none survived to our time. 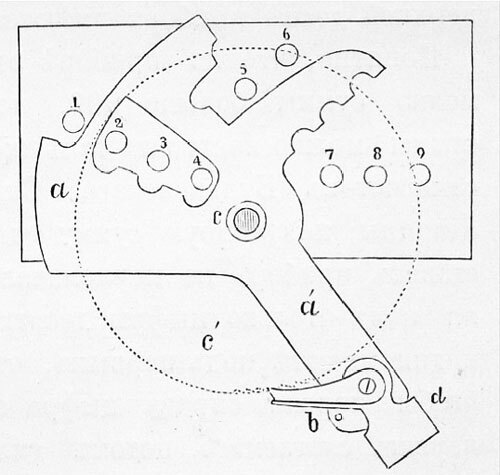 Let's examine the mechanism of the device, using a simplified drawing of the first patented machine, similar to that, presented in the book of von Bohl (Фон-Бооль, Приборы и машины для механическаго производства арифметических действий). On the upper side of the box of the machine (marked with A on the upper drawing) is placed a result window (a) and a lever (L). The keys (k) are placed in 2 rows, 5 keys on the lower row (for 1, 3, 5, 7, and 9) and 4 keys on the upper row (2, 4, 6, and 8). The lever L is fixed over a crowbar-lever a (see the lower drawing), and rotates around the axis c, by means of a spring. When a key is pressed, the corresponding fixing pin (pins are marked 1, 2, 3, etc. on the lower drawing) moves vertically, thus stopping the rotating crowbar-lever at the corresponding angle. Thus the angle of rotation of the calculating mechanism depends on the pressed key. The ratchet wheel c' has 100 teeth, so pressing of 1 key will rotate it on 1 tooth, pressing of 2 key will rotate it on 2 teeth, etc., showing the corresponding number in the result window a. When a key is depressed, the corresponding fixing pin goes down, and the crowbar-lever a returns to its initial position, while the ratchet wheel c' remains in its position, fixed by the spring-lever b. On the ratchet wheel c' against the 0 position is placed a long tooth, which is engaging a smaller 10-teeth ratchet wheel during the rotation, thus implementing the tens carry mechanism. So the capacity of the calculating mechanism is up to 999. The zeroing (set to the initial position) of the machine can be done by means of the lever L or a small button near it.